If only chessboxing had come along a couple of decades earlier, we could have had some of the most entertaining championship bouts known to mankind. "Holmes is attempting to move his queen while still wearing his boxing gloves; pieces are flying everywhere! Spinks believes his bishop is made of chocolate ... and now he's eaten it! And that's the end of round two!" 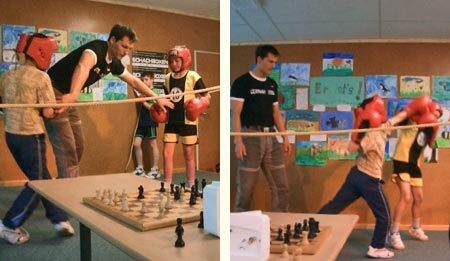 A 37-year-old policeman, "Anti-Terror" Frank Stoldt from Berlin, won the first Light-Heavyweight World Championship title in chessboxing after defeating American David "Double D" Depto at the Berlin Tape Club yesterday. After a grueling battle, a checkmate in round seven produced a clear victor. Hey, "Anti-Terror" is my nickname! That chessboxing is sweeping the world should surprise no one; ESPN televises it, and there are even youth leagues cropping up. But the sport will never really catch on until they address the many hygeine issues. If I wanted to play an indoor game with a fat sweaty athlete, I'd take on Curt Schilling in World of Warcraft.